It’s funny how cooking without power is regarded as a survival skill when for thousands of years, it was the only way to cook. Not long ago, there was no such thing as toasters, microwaves, and electric ovens, yet people still managed to cook big, delicious meals for their families. If they could do it, so can you! There’s no reason to be intimidated by the prospect of cooking without electric appliances. It’s easier than you think. For most people, the only way they’ve ever cooked without power is with a grill or a campfire. But in this dangerous and unpredictable world, it’s important to have more options than that. What if you run out of propane? What if you can’t find any firewood? What if you have to cook on the road? You should always have a backup, and a backup for your backup. 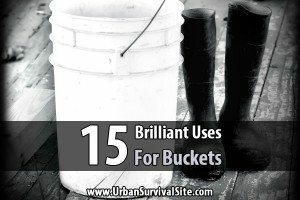 In this article, we will learn about all the best methods for cooking food without power (both indoors and outdoors), some off grid cooking tips you should take into account, and a list of recommended products. Clear a round area of all plant material, leaving nothing but dirt behind. Surround it with large rocks, bricks, or stone pieces. Place your tinder (leaves, pine needles, etc.) in the center. Build a teepee-like structure around it with sticks and twigs. Leave an opening large enough for you to light the tinder. Light it, blow on it, and add fuel if necessary. Once the teepee falls, add some fuel logs to the fire. Once you get a good fire going, lay large fresh logs right next to each other on one side of the fire and use them as a place to set your pots and pans. That’s all there is to it. The great thing about campfires is they give you so many ways to cook. Want to stab your food onto the end of a stick and roast it over the flames? Check. Want to set a grate over the fire and boil a pot of water or fry some eggs? Check. Want to set a tripod over the fire and hang a pot of soup over the flames? Check. Want to wrap some potatoes in aluminum foil and set them next to the base of the fire for a baking effect? Check. If you’ve never cooked this way, be sure to practice. If any of the following methods fail or are simply unavailable to you, campfire cooking will be your final backup. Note: When you’re done, make sure you put out your campfire completely. Drown it with water, then mix the ashes and embers with the soil by stirring it up. Make sure everything is wet, then check if the ground is cool enough to touch. If it’s still too hot to touch, repeat the process. Be sure you didn’t miss an embers as it only takes one to start a fire. You probably never thought about using your fireplace for cooking, but if the power goes out for a long time, you might have to. Even though you’re cooking inside your house with a fireplace, it’s really no different than cooking over a campfire. Place a cooking grate into the fireplace upon which you can set pots, plans, skillets, or food wrapped in aluminum foil. Next, place some fire logs in your fireplace and light them. Once the flames are at the right height for your cooking grate, start cooking. Just remember that cooking with a fireplace requires extra precaution on your part because, if not maintained or done correctly, it could potentially cause a fire in your home. Try to keep the fire down in order to minimize the number of sparks or embers that escape the fire place (this is why most open fireplaces are not located in a room with carpet). Oak, maple, and hickory woods are the best choices for an indoor fireplace. Not only will they provide a good seasoning on your food (which is why they’re also good choices for outdoor fires), they will also burn longer and won’t create as much smoke. A majority of homes in America have a grill in their backyard or garage, so there’s a good chance you have a grill in your home as well (even if it’s just a small model that can only cook one thing at a time). Most grills are powered with propane, and many people mistakenly believe they can only use their grills until their propane runs out. 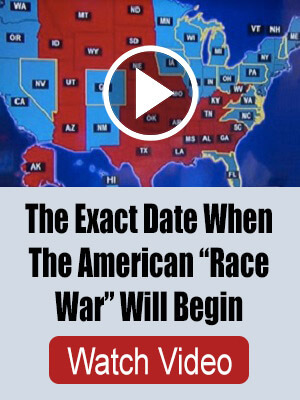 This is simply not true. You can also use any normal gas-powered grill as a charcoal or wood-burning grill. Setting charcoal or pieces of wood inside of your grill and lighting them on fire will easily create enough heat for you to cook your food quickly and evenly. Better yet, get a grill that is half charcoal half propane. A portable stove that runs on propane is a great thing to have. It’s easy to use, you can take it almost anywhere, and it can cook practically anything you want. Just make sure you have plenty of propane cylinders (which, by the way, are a lot cheaper at the store than online). The Coleman Road Trip Propane Portable Grill LXE is great for cooking big meals. It easily ignites with the push of a button, folds up into a nice compact size with wheels and handles for easy transportation, and is constructed out of cast iron and porcelain surfaces that not only make it highly durable but easy to clean. The only downside is it’s a bit pricey. A cheaper option is the Coleman Classic Propane Stove. I’ve been using this one for years and have never had any major issues except for the fact that the flame is always on high, even if you try to turn it down. But if you want to go even smaller, check out the Coleman Single Burner Propane Stove. The cooking power is easily adjustable, it ships with one sixteen ounce cylinder of propane that can last up to nine hours, and it will keep going regardless of the weather conditions. In many ways, butane stoves are even better than portable propane stoves. They’re a little larger than a big textbook, they get hot enough to cook anything, and they’re safe to use indoors as long as you use them by an open window. However, butane stoves go through fuel a lot faster. GasOne canisters only last one to two hours, whereas propane cylinders can last several hours. Because of this, butane stoves are best for short-term cooking (such as a camping trip) and not something you want to use day in and day out for a long time. A folding stove is exactly what you think it is: a mini stove that folds up. The most popular are Sterno stoves, and they require a certain type of fuel which is often referred to as canned heat. These 7-ounce cans usually last about 2 hours and can be used over and over until the fuel gel is gone. If you’ve ever been to a catered event, you may have seen canned heat being used to keep platters of food warm. Although I’ve used canned heat indoors before, the label says to use them in a well ventilated area. So if you want to be on the safe side, be sure to use it near a window that is open at least a few inches. But if you’re in a scenario where it’s very cold outside and you don’t want to open a window, you could get some Biofuel by Greenscapes which is completely non-toxic and safe for indoor use. Because they’re so small and lightweight, folding stoves are also great for bug out bags. The only downside is they don’t get nearly as hot as other stoves, and it’s even worse if you’re outside in the wind. They can be used to boil water (eventually), heat up canned food, or even fry eggs, but you should never ever try using a folding stove to cook raw meat. If you’re worried about running out of propane, butane, or canned heat, consider getting a Solo Stove. It’s a portable stove that runs on twigs, leaves, pine cones, and other small pieces of wood. 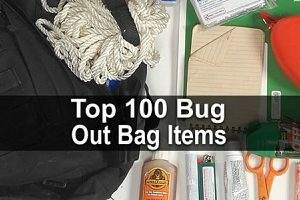 This one is also great for bug out bags, especially since you don’t need to bring any fuel with you. The company behind it also makes stainless steel pot sets and wind screens. If the Solo Stove seems too expensive, check out the Solo Stove Lite which is a good bit cheaper. Speaking of wood stoves, a good old fashioned wood stove is another great option. Not only do they cook food, they can also be used to provide heat in the winter (which is why people used to put them near the center of their houses). Take note that while some wood burning stoves are intended for heating rooms and not necessarily for cooking, you can still use them for cooking if you need to. When heated enough, you can set pots or pans on the tops of these stoves and cook practically anything you want. They’re not particularly hard to find, either. Just check eBay, Craigslist, and large flea markets on a regular basis until you find one. This is yet another type of wood-burning stove that most preppers and survivalists should be familiar with. Basically, it’s a chimney-like structure of bricks with an opening at the bottom. A fire is started at the bottom and the heat travels up the chimney to a pot or pan sitting on top. Not only is the rocket stove a very efficient method for cooking food, it’s also dirt cheap. As long as you have bricks and a cooking grate, you can construct your own rocket stove in a matter of minutes. Watch the video below to see it done. The real beauty of the rocket stove is how it’s able to create a large amount of heat with a minimal amount of fuel. The reason is because the chimney traps all the heat generated by the fire, making it very hot and very efficient. With a rocket stove, you can cook anything you want. Solar ovens, as the name suggests, use the power of the sun to cook food. As long as you have enough sunlight, you can cook just about anything. Also called solar cookers, solar ovens are inexpensive and easy to build if you aren’t able to buy one. And since they only use the sun for heating and cooking food, they require no additional fuel. This makes the solar oven one of the best methods for cooking food in areas where fuel is scarce, such as the desert. If you’re not interested in building your own, you can buy them online for a reasonable price. The Sunflair Portable Solar Oven comes with a thermometer, a baking tray, a dehydrating rack, 2 silicone pots, and a carrying bag. They also make a smaller one for about 2/3 the price. Kerosene heaters are very popular for heating up rooms. While they have not traditionally been used for cooking, they can still be used that way if they get heated up enough. The tops of them will sometimes become hot enough for you to boil water, make coffee, or heat up a can of soup. If you live in a cold area and need a heater anyway, this is a great option. Kerosene heaters, such as this one by Dyna-Glo, are safe to use indoors as long as there is plenty of ventilation. This is really a last resort option but it’s very doable. As the name suggests, you use the motor of your vehicle to cook food. This method is best done outdoors so carbon monoxide doesn’t build up in your garage. To do this, turn on your car and allow the engine to run for a period of time. Wrap pieces of food in aluminum foil and place them strategically around your car motor. Wait until the food has cooked through, then remove them from your car and shut off the engine. The biggest disadvantage to the car motor method is that it wastes a lot of gasoline. This is why it’s a last resort option that should only be used when no other methods are available. In a true grid down scenario, all of the gas stations are going to be shut down, meaning you will only have the gasoline you stockpiled. You’ll obviously want that fuel for driving or running your generator. On the other hand, if you’re bugging out and your motor is nice and hot anyway, consider using it for foods that don’t need much heat. 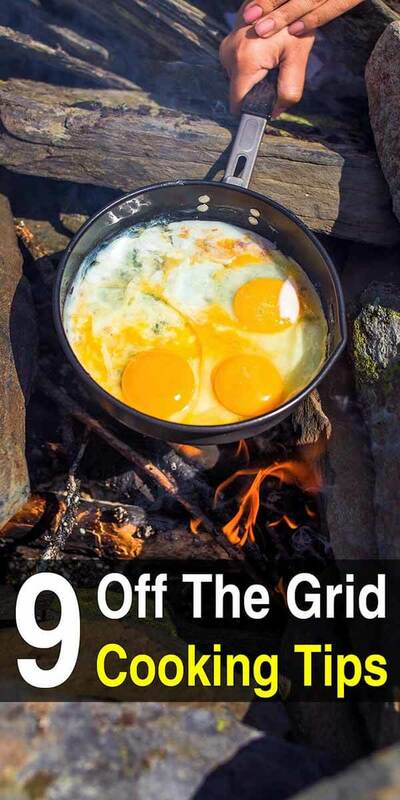 In this article, we’ve covered 12 off-grid cooking methods, but there are several others. No matter which method you choose, there are certain tips that always apply if you want to be safe and cook a delicious meal. That’s what we’ll cover next. And by practice, I don’t mean do it once and never do it again. I mean you should practice extensively by preparing entire meals for your family using the above methods. This is the most important piece of advice. There are so many things that can go wrong when cooking without power, but if you practice ahead of time, you’ll be ready for anything. If you practice enough and with many different types of meals, it will start to feel like second nature. Then if the power goes out, it won’t be a big deal. In fact, it might be an excuse to cook a delicious meal with the food in the freezer. Whenever you clean a fish or butcher small game, wrap the meat in non-toxic leaves. You don’t have to do this with ordinary meat if you don’t want to, but you should definitely do it with fish. Loosely tie the leaves over the meat with some vine or cordage. There are two reasons for doing this. First, the leaves will season the fish and make it taste better. Second, and more important, it will protect the skin of the fish from burning while it’s being cooked. Simply place the fish meat wrapped in leaves over the fire coals in order to cook it. There are a wide variety of leaves that are a suitable choice for this tip, but the leaves from sycamore, walnut, oak, maple, cherry, and chestnut trees work the best. Many people have a bad habit of not using lids when they cook, as if lids are just decorative. However, you should always use them–especially when cooking without power–because they make your food cook faster while retaining more liquid, even if you lower the heat of the fire. Folding stoves are safe to use indoors, as are butane and propane stoves (although I would use them by an open window). But if you use any other methods, please be safe and make sure that smoke and gas do not accumulate where you are cooking. Make sure the flue in your fireplace is open, and also make sure your fire isn’t near anything flammable. Consider getting a carbon monoxide alarm just in case. It’s understandable if you don’t have olive oil with you in a grid down situation. But if you do, you should use it, especially if you’re frying meats or vegetables on a skillet. Not only is olive oil healthy, it makes cleaning the pots and pans a lot easier. Saving time on dish cleaning gives you more time to spend on other important tasks. It’s okay to have some electrical appliances such as a microwave or toaster. However, I recommend getting some kitchen gadgets that work without power and using them on a regular basis. That way if the power goes out, it won’t be a drastic change from how you’ve already been cooking. You should never have just one cooking pot or a single set of cooking utensils in your cooking arsenal. Have a variety of different sizes of pots and pans and different kinds of cooking utensils as well. This way you’ll be prepared to cook almost anything grid down situation. 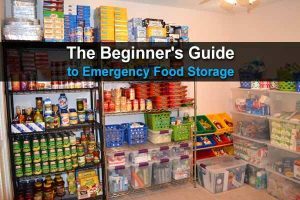 You want your cooking materials to last a long time, especially since you never know how long a disaster is going to last. That’s why you want your cookware to be of the absolute highest quality, and cast-iron is simply the best option for this. It will last you a long time through many cooking sessions. By the way, if you’ve never used cast iron before, here’s how to season a cast-iron skillet. Just don’t. Accidents happen when you least expect them, so make sure there’s always an adult around to keep an eye on the fire or grill. This tip should be obvious, but accidents happen all the time because people go inside or don’t pay attention while their food is cooking. Now that we’ve covered 12 ways to cook without power and 9 off the grid cooking tips, it’s time to move on to product recommendations. In this section, we’ll discuss some suggestions for cookware products and tools you should have in your off grid cooking arsenal. All of these products are available on Amazon, and while you don’t have to go with the exact models suggested here, you should at least go with something very similar. Now on to the list. The Cuisinart Deluxe Grill Set comes with a spatula, tongs, skewers, basting brush, cleaning brush, a temperature fork, and an aluminum case. Everything is made of stainless steel, which is ideal for grilling. This is essential for campfire and fireplace cooking. Basically, it’s a grill that sits over your fire and holds your pots and pans. It needs to be durable enough to handle the intense heat of the fire and the weight of the cast iron cookware you set on it. The Texsport Heavy Duty Camp Grill is a great option for this. It folds up nicely for easy storage and transportation, and it also comes in three different sizes: small, medium, and large. Texsport has designed their Heavy Duty Camp Grill with welded steel so that it can handle heavy cookware. This 10-piece mess kit by MalloMe comes with a nonstick pot, a nonstick pan, two bowls, a folding spork, a soup spoon, a wooden spatula, a cleaning sponge, and a drawstring pouch. Since it all fits together inside the pouch, it takes up very little space. This is perfect for one or two people enjoying some soup or stew. This enamel coated cast iron skillet will resist rusting and provide you with a cooking surface that is non-stick. It’s ten inches wide with a flat surface, so the heat will be evenly distributed across the pan for cooking everything from scrambled eggs to stew. It is recommended that you allow this skillet to cool off completely before you wash it in order to preserve its non-stick qualities. This is the ultimate skillet for large crowds. As you can see in the picture, it’s big enough to fry a pile of hash browns, several strips of bacon, and a dozen eggs at the same time! Granted, it’s not very portable, but if you have a large family or group, consider getting one. Lodge has been constructing cast iron cookware for over one hundred years, and from the very beginning of their history, they’ve been known for their rugged, long-lasting products. The smooth side is for things like eggs, bacon, and pancakes, and the ribbed side is for things like steak, chicken, and hamburgers. This cast-iron grill/griddle combo has a nonstick surface that is seasoned with oil. It’s 9.5 by 16.75 inches which means it can extend across two burners, allowing you to cook multiple things at once. All in all, a good camp griddle is one of the more overlooked off grid cooking items, but it’s also one of the most efficient. This five-quart Dutch oven can hold everything from chili to Asian chicken and. As a flat-bottomed model, it is designed to sit directly over a burner or inside an oven rather than hanging from a tripod. Lodge sells their Dutch ovens with a limited lifetime warranty that protects the product against any defects. If you take good care of it, you’ll be able to pass this Dutch Oven down to future generations. A Dutch oven tripod is designed to have its legs propped up around a campfire with a pot or Dutch oven suspended beneath it over the flames. It’s an old but tried-and-true design that can be very effective for cooking. This tripod features legs that measure forty-three and a half inches long, with a galvanized chain for holding onto the pot or oven. This does exactly what it sounds like it does. It allows you to remove a Dutch oven lid without burning yourself. This is important because it’s not safe to remove a Dutch oven lid with just a pot holder or oven mitt, especially if you have hot coals on the lid. It’s just too hot. This lid lifter by Lodge allows you to remove the lid to check on your food and shake ashes off of it if necessary. Your Dutch oven should never touch the ground. It could get dirty (thus getting dirt in your food) or it could burn something. The solution? A Dutch Oven Lid Stand by Lodge. The great thing about this is you can also put it in some hot coals and set a Dutch oven or cast-iron skillet on top of it. Because of that, I recommend getting a couple of these. Everyone knows a rotisserie is one of the best ways to prepare foods like chicken and turkey. With the Texsport Rotisserie Grill and Spit, you can slow-roast a chicken and grill food at the same time. The grill is 16 by 24 inches, and the height of the whole thing can be adjusted based on the size of your fire. This is a great way to quickly and easily cook chicken, hamburgers, hot dogs, and vegetables. Just put your food in the basket, snap it shut, and hold it over the fire. Better yet, put it on your grill. This makes it very easy to flip multiple pieces of food at the same time. With this one, you can adjust the depth depending on what kind of food you put in it. A fire iron is an awesome way to make a grilled cheese sandwich, or any other hot sandwich. Basically, it’s a square cast-iron box that opens up. You just put your sandwich inside, close it, and hold it over the fire until your food is ready. Easy peasy. These are essential for roasting marshmallows or hot dogs, or for making shish kabobs. This set comes with a dozen 12-inch skewers. If those are too short for you, here are some longer ones specifically for marshmallows. This is a fun and unusual way to cook food. It’s like a fishing pole, only you hang it over a fire. It’s perfect for hot dogs and marshmallows, and it even has a mechanism where if you give it a light tug, your food flips over so you can cook the other side. The fishing pole campfire roaster is great if you have kids. If you’re using cast iron cookware, you’ll want to keep it nice and clean. You don’t want to use soap on cast iron because that will strip the pan’s seasoning. You can use a brush and hot water, but that can be difficult and time-consuming. This stuff is a blend of all-natural oils that break down food particles and make cast iron much easier to clean. Although you can use a sponge or scrubber to clean cast iron, that can be hard to do, especially with caked-on food. With this chainmail scrubber, you can scrub food away without stripping away the seasoning. Well, that’s about it, so thanks for reading! 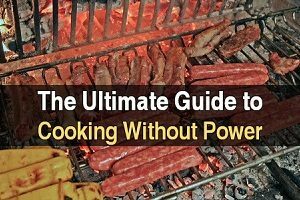 I hope you found this ultimate guide to cooking without power useful. If you have any cooking methods, off grid cooking tips, or products you want to recommend, be sure to leave a comment and let us know about it. Yo what’s up with people preaching about gettin outside in the comments? Like do they not realize who they are talking to? It’s like going to a gym and trying to shame people for not working out. I recommend getting a Coleman single burner stove that burns Coleman fuel (not recommended, pricey), gasoline or kerosene. I’ve used gasoline for decades and have never had a single problem using it. I even use it in the Coleman lantern. Thx for your article, I find it unbelievable people don’t know this stuff already. Get out of in front of your helevision, it will lead to your demise. God Bless you and yours. We live on a farm/homestead in South Africa and we don’t have electricity and the only running water comes from a river which runs through the farm. We grow our own vegies and have goats for milk and meat,bee keeping for the honey,chicken for the eggs and rabbits for meat and fur.This is our first year on the farm as we have moved out of the city cause that where the most damage to you as a person can done when the shtf. I lived in the mountains of Montana, did a lot of my cooking in dutch ovens and that includes baking in those dutch ovens, coals under and over. It does take a lot of practice to learn how to do it to perfection. I remember to this day the day I made our Thanksgiving meal completely in dutch ovens. Half a turkey per large ovens, all the way bread and dessert. I learned a lot over those years of living there. Thank goodness for the time I spent at Rendezvous and with a ladies group. If I had not done that ahead of time, I may not of made it. LOL,I ACTUALLY HIT THE FLOOR LAUGHING OUT LOUD.I can’t believe it but I guess its TRUE.TOO MANY FANCY GAGETS LIKE T.V.S,COMPUTERS,CELL PHONES,DUH!,When I was growing up we had to cook food the old way as you say it.But it was the way of life.And even today I still own a wood stove and a wood furnace for heat.But I use a gas furnance for now but wood when I’m home.It’s a beauty of heat that is so nice.Being born in the start of the 50’s that made know how to SURVIVE if S.H.T.F.Cause today it is hard to get kids to learn things of the past.Too many fancy toys to PLAY with.Maybe I was born a PREP-PER without even knowing it.I know 1 kid out of unknown amount that wants to learn. he will survive.I find it fun to do things with someone that DON”T know how to do things.But it is nice to see someone somewhere telling people to be PREPARED.FOR IT’S AROUND THE CORNER.WWW.3,I HATE THE THOUGHT……….GOOD-LUCK. Almost all canned fuels say that they have to be used in a well-ventilated area because they emit harmful toxins. I live in a small apartment and had to take that into consideration. I found a brand at Wal-Mart called Biofuel by a company named Greenscapes which says that their canned fuel is non-toxic and safe for indoor use. I tried it out and it got a small frying pan hot enough to cook eggs in just a couple of minutes so I imagine heating up a can of food should be simple. I tried to boil 2 cups of water but the smell from the flame burning the bottom of the small pot got to me after 25 minutes. The water was almost to a boil at that time but I just couldn’t take the smell any longer. I’m not trying to recommend one brand over another but that’s the only brand I know that has stated it’s non-toxic. Thanks for the recommendation. I honestly thought Sterno was perfectly safe to use indoors (I’ve done it plenty times before), but I checked one of my cans and sure enough it says to “use in a well-ventilated area.” I guess it’s best to stay on the safe side. I’ll update the article and add a link to Biofuel by Greenscapes. Thanks again! Thanks for the info! I’ve been trying to figure out how I would be able to heat food/boil water should there be no power (in city, small apt., electric stove). So much prep info, it’s overwhelming but I read almost anything I can find looking for little nuggets of info I can apply to my circumstances. I clicked on the link for the enameled cast-iron skillet you recommended in #4, and it’s listed as “currently unavailable” on Amazon. Is there another one you’d recommend? Thanks. Oh I didn’t realize that was no longer available. Thanks for letting me know! There’s a similar product here: http://amzn.to/2dEPuwr. I haven’t used it myself but the reviews are pretty good. You said nothing about a refector oven . I’ve used one to cook a pie using heat from the coals from a campfire . Great suggestion! This is one of those big articles that I’ll come back to and update from time to time. I’ll make a note about reflector ovens.